Most cities require permanent fences around pools at homes where children 6 years old and younger are living. Pool fences also are suggested for any home where young children visit or spend any length of time. When installing a fence, first check out the guidelines of your municipality. Make sure the fence meets specifications as to spacing of slats or chain links, as well as other requirements. 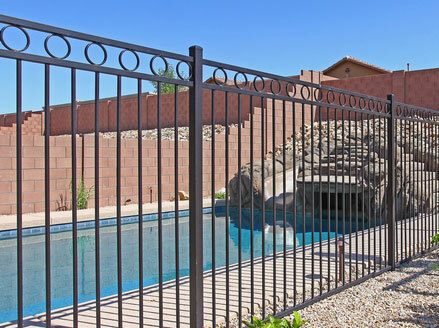 City of Phoenix requirements call for permanent 5-foot,non-climbable fences that have self-closing and self-latching gates that open outward from the pool. All latches must be 4 1/2 feet or inaccessible from the outside by small children. Any opening in the fence must be less than 4 inches wide. If a wall of the home is used as part of the pool enclosure,doors leading from the home into the pool area must also be self-closing and self-latching. There are other particulars. Check with the city of Phoenix or your municipality for its pool barrier ordinance. Make sure an existing pool fence is in good shape and stable,not wobbly or falling over. Pool fences need to be maintained like cars and appliances to be effective, Phoenix Fire Division Chief Bob Khan said. If a fence is unsteady, have it stabilized by a contractor or handyman. Faulty or broken latches and hinges negate the value of having a pool fence, Khan said. Keep gates closed securely at all times. Never prop them open. All too often people prop open gates, which creates an invitation for wandering children to enter the pool area unsupervised,he said. If the gate has a lock, keep the keys well out of children’s reach.